Various sources on the internet - such as Crane (machine), A History Of The Crane and The sky is the limit: human powered cranes and lifting devices - state that the Ancient Greeks were the inventors of the crane sometime during the 6th century BC. 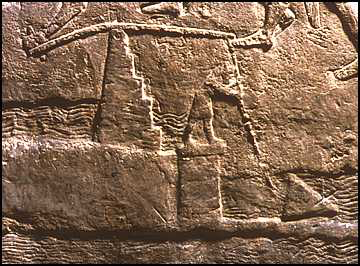 Cranes were adopted and improved upon by the Romans; the image below is the earliest depiction of a crane I've been able to find. This appears to be a treadwheel crane and the it's the only depiction of crane from ancient times I've found - more than 600 years after the crane was invented. Are there any earlier depictions, for example in reliefs or vases or murals? If not, are there any other pre-medieval depictions of cranes? The Roman builder Lucceius Peculiaris would be another pre-medieval example. 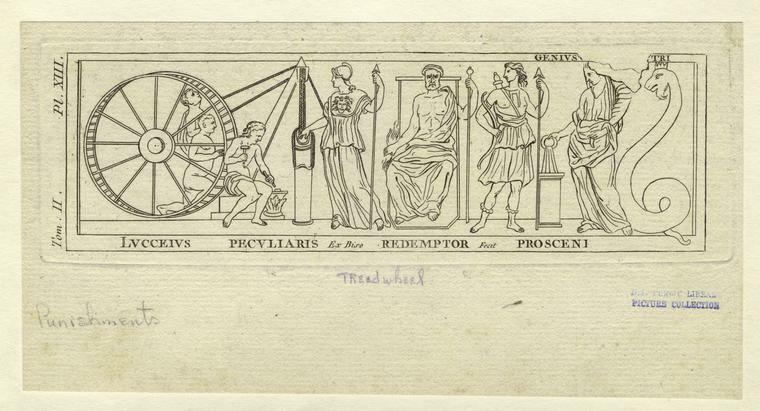 Lucceius ; Peculiaris ; Ex Biso ; Redemptor ; Fecit ; Prosceni. 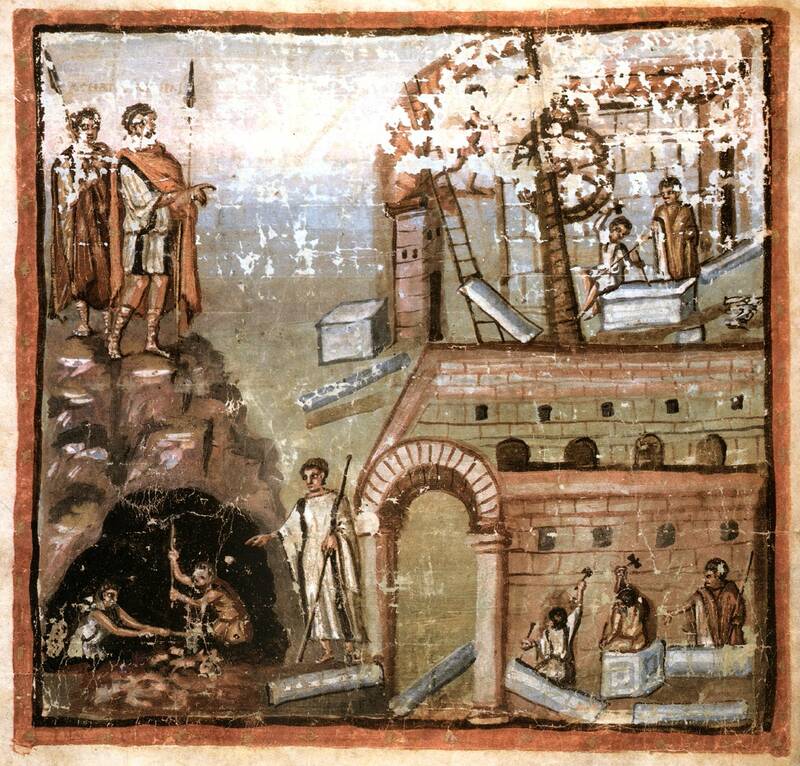 The illustrated manuscript Manuscript - Vat.lat.3225 also caled Vergilius Vaticanus from the 4th century contains scenes from "building a city"
Romans are great, Greeks are even greater? But they are youngster. As this is about the oldest of these devices, we usually have to look into Mesopotamia or Egypt? This relief from Nineveh shows a man with a shaduf (A bucket attached to a long beam, weighted at one end, and balanced so that the bucket will rise easily.). He is changing the course of a stream to help Sennacherib's workers move a giant sculpture. Alabaster wall panel relief in two parts: showing a winged bull for Sennacherib's palace leaving the quarry. The bull, roughly finished, has been placed on a sledge which advances on rollers, hauled by prisoners of war. Four overseers, two with trumpets, direct the operation from the top of the colossus. On the left, the king stands in hand-drawn chariot. Some men clear rocks from the track; others pull on a long lever, wedged into place to shift the load when it sticks. Below, men use buckets, attached to counterpoised arms to raise water and divert a stream. 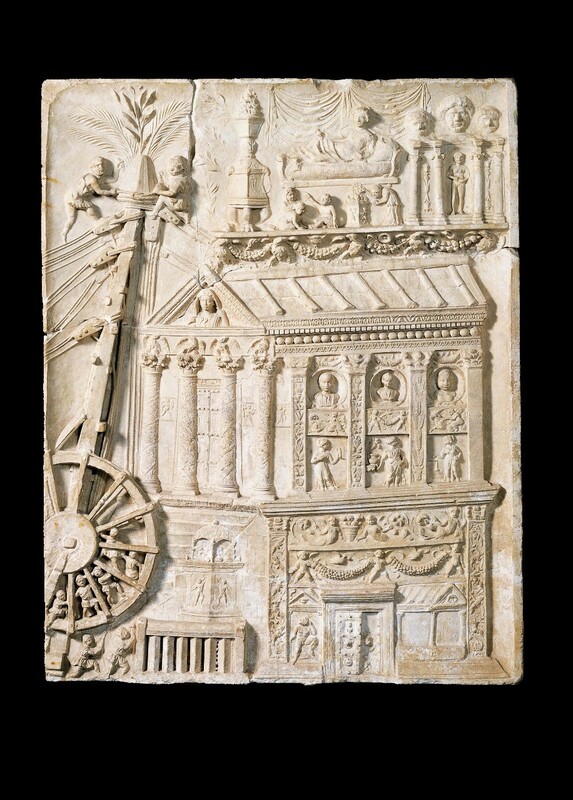 From Gypsum wall panel relief in two parts: showing a winged bull for Sennacherib's palace leaving the quarry. This type is believed by some to have been used in Nubian pyramid construction. One of the earliest versions of the crane to be developed was the shaduf, first used to move water in Egypt about four thousand years ago. The shaduf consists of a long, pivoting beam balanced on a vertical support. A heavy weight is attached to one end of the beam and a bucket to the other. The user pulls the bucket down to the water supply, fills it, then allows the weight to pull the bucket up. The beam is then rotated to the desired position and the bucket is emptied. The shaduf is still used in rural areas of Egypt and India. Construction work was demanding. The expanded use of large pieces of marble and other heavy stones like granite necessitated ever-larger lifting apparatuses. Made of wood, there are scant material traces of these apparatuses, but they do appear in art and literature. A terracotta plaque from Via Cassia shows a general in armor standing amid representations of a military trophy, flying victory, and a kneeling representation identified as Roma. On either side are smaller figures operating wrench cranes to lift squared stones for massive walls (Schäfer 435–436; Figure 6) . Although interpretations of this scene vary, obviously, the inclusion of a building act assumes familiarity and potent meaning for construction. 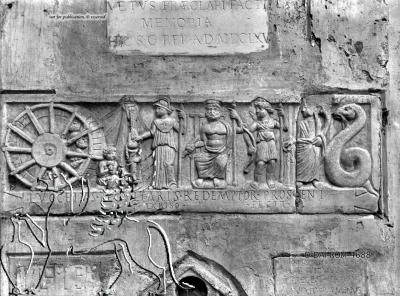 Similarly, a carving from Capua commemorating a vision by Lucceius Peculiaris, possibly a contractor for the Augustan rebuilding of the amphitheater, shows a hoist and treadwheel crane lifting a monolithic column (Sear 7). Vitruvius devoted an entire chapter to hoisting machines which he associates with a certain magnificence (10.1.2). Not the answer you're looking for? Browse other questions tagged ancient-history ancient-rome ancient-greece technology or ask your own question. Who is the earliest recorded person? Earliest Recorded Name in History?